Sunday was the day of the “big gale”. There were huge winds and gusts, and constant driving rain all day. I’m told the area received over 3 inches of rain in less than 24 hours. The animals didn't seem to be very happy with the weather, either! Most people on the TGO found inside shelter, it seems. Alltbeithe was a real haven, and I spent the time in the company of some other great folks, including David Lintern and Tanya Morgan. It was definitely good to be there. 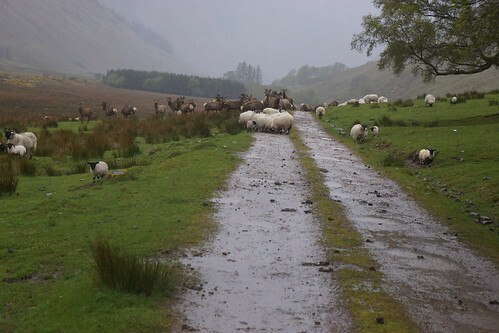 Additional note (7 June): Alltbeithe (Glen Affric Youth Hostel) is a remote SYHA (Scottish Youth Hostel Association) hostel in upper Glen Affric. It wasn’t actually quite on my planned foul weather alternative route, but it was very close to it, and by the end of the day on that Sunday it seemed to make a good deal of sense to head there – and then stay there for the night (see David Lintern’s blog for their rationale on that, and other, TGO Challenge decisions). 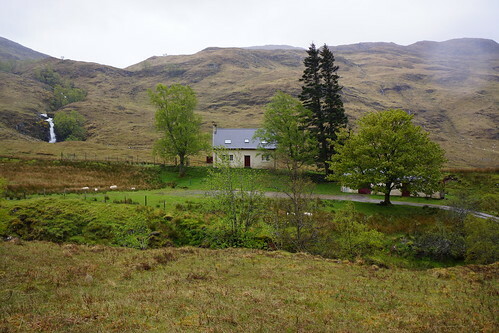 The hostel is indeed quite remote – it’s about 8 miles on a rather basic track from the nearest real road. It’s run by wind power, heated by wood or coal fire, and the only outside communication is by satellite phone. It really is a great place, and our host, Audrey, was great. Besides David and Tanya, others sharing the hostel that night were Kirsten Paterson, from Perth, also on her second Challenge, and some other delightful folks (some Challengers, and some not) whose names I’m just not quite recalling at this point. The rain began to lessen at some point after dark (beyond 10:00 PM), but the wind continued quite strong for a good while longer. 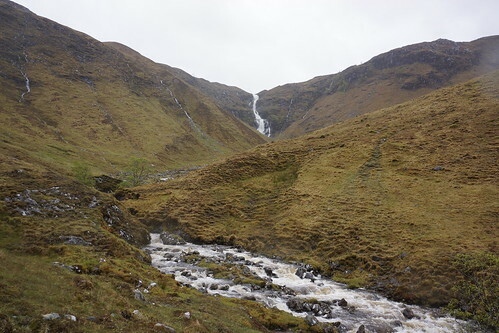 I was sleeping in the bunkhouse out behind the hostel proper, and was able to make it there getting blown a bit but without really getting wet. I slept well.